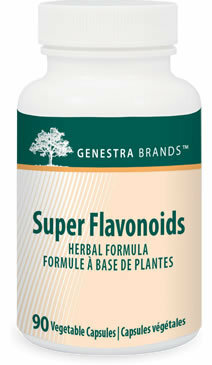 Super Flavonoids provides a broad range of bioflavonoids known for their abilities to improve capillary integrity and the collagen matrix, making it effective in inflammatory and allergic conditions. Bioflavonoids are known to prevent the breakdown of vitamin C, inhibit free radical damage to cells and improve all immune processes. Super Flavonoids is indicated for osteoarthritis, rheumatoid arthritis, asthma, allergies, gingivitis and bleeding gums, Crohn's disease, colitis, and connective tissue disorders, and for reducing pain and inflammation, especially in post-surgery. Recommended Adult Dose: Take one capsule three times daily with meals, or as recommended by your health care practitioner.